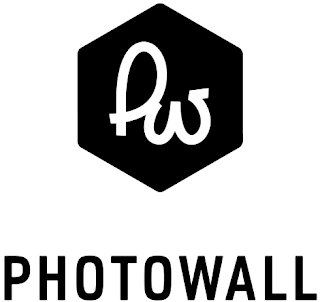 Now if your like me and love to adorn your home with cool imagery, capture photos of your family or have a feature wall with your favourite pet.....then Photowall may be the perfect pitstop to fulfil your needs. 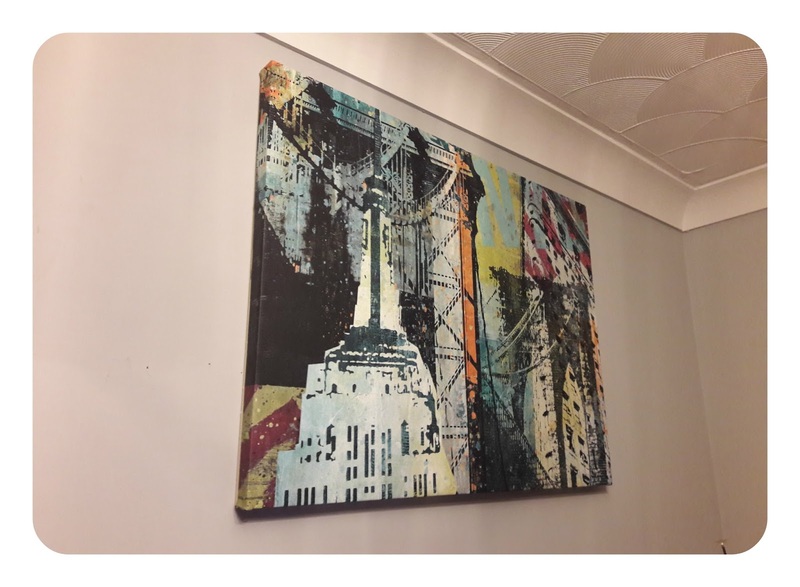 You can choose from either a standard wall murals or photo wallpaper - both of which can be customised to whatever size you want, and a handy calculator with tell you the exact price for your size. Wall murals can be non woven in premium or standard formats. 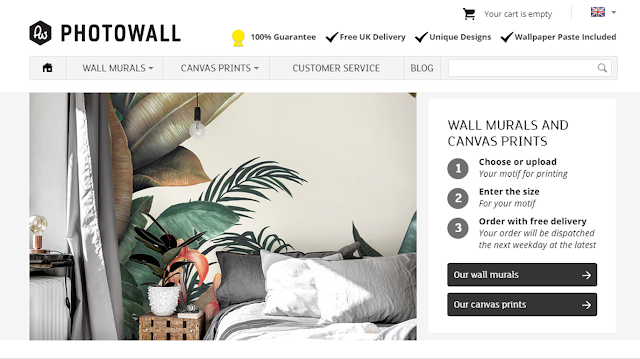 You can choose from over 3000 designs from 70 designers, and designs are categorised for easy finding, including categorised by colour or rooms so you can perfectly match it to your decor. There is also the option to upload your own image. Made from 100% cotton they are available in either do-it yourself frame packs (see mine below) or frameless. Again there are thousands of images to choose from plus a large selection of designer prints, and also the option to upload your own image. You can choose framing, edge and size and again the handy calculator will tell you your price. The process is easy to do and simple to order with delivery taking 4-6 days. Photowall have a huge focus on producing their goods in the most environmentally friendly way. Their factory minimises impact by ensuring all production is to order, meaning nothing is held in stock and the inks contain no nasty solvents/chemicals and are biodegradable. They also support an aid organisation called Vi Agroforestry where every year they plant over 5,000 trees in an areas near Lake Victoria, eastern Africa. 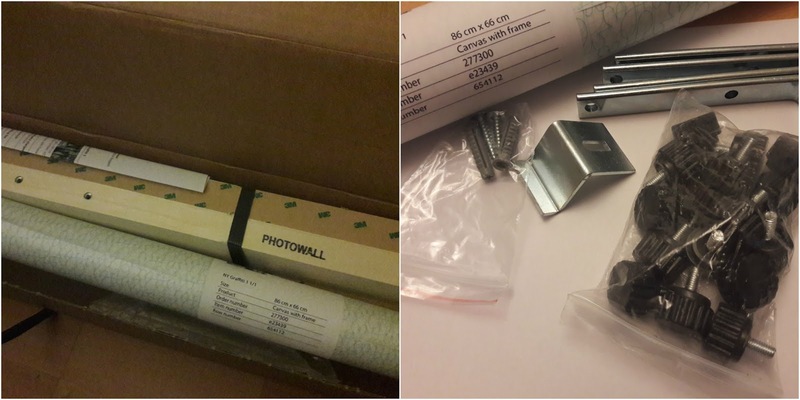 Picture hook and screws to hang your frame. The process to put the frame together is pretty straight forward, lay your canvas flat, image down. Take one of the frame edges and peel off the back - you then place it on the edge between the 2 pre-cut corner. Repeat the process untill all 4 are placed. (see image below left). 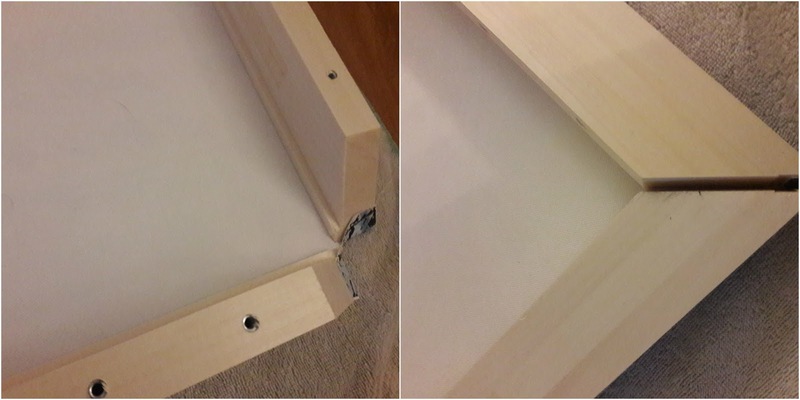 You then roll in each edge and if placed correctly the two edges will meet (see image below right). 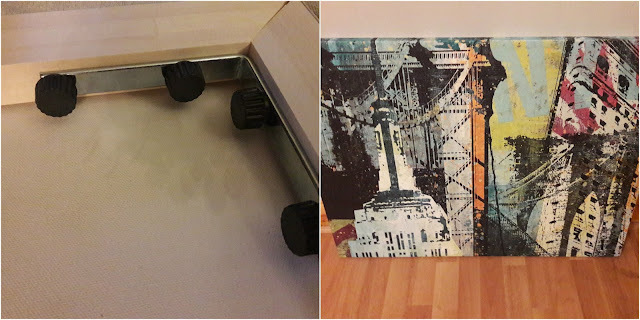 You then place a bracket in the corner and screw 4 screws into the pre-drilled holes - this will secure the frame in place...and tada.....your canvas is then ready to hang. Fancy getting one for yourself.....Photowall has kindly offered all my readers a fab 20% discount on any order made between now and the first week of March. Huge thank you to Jennifer at Photowall for kindly allowing me to review this canvas. All view are my own.